Sales Office: Monday through Friday 9 am to 5 pm CST. If you find yourself in Southeast Louisiana or the Mississippi Gulf Coast come by and see our showroom in Slidell, Louisiana. CLICK FOR DIRECTIONS. 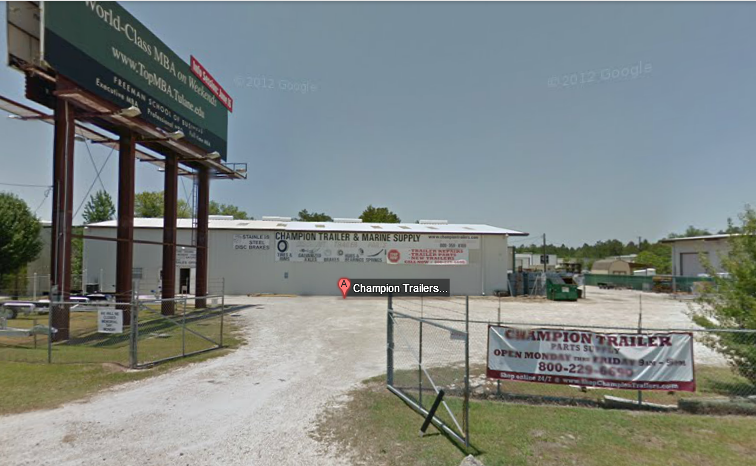 Champion Trailers is a widely known, respected trailer parts and repair company located in Slidell, Louisiana. Our highly qualified and knowledgeable staff provides valuable insight and help for our customers whether they are buying the parts at present, purchased parts in the past, or just need help with a problematic install. Champion Trailers is recognized for providing high quality product at prices all customers can afford. At Champion Trailer we believe in helping the customer get the correct parts they need without hassle and extra cost. We carry a variety of trailer parts in stock for sales and repairs. In some instances we can find those hard to get trailer parts for our customers. Champion Trailers carries parts such as trailer hubs, trailer bearings, leaf springs, trailer axles, winches, winch post, and many more boat or utility trailer parts. Come by and see us for your boat or utility trailer repair...FREE ESTIMATES! Don't forget to come see us for a new aluminum trailer when your current trailer has just worn out. We encourage all of our customers to sign up for our online newsletter mailing list to keep up with any promotions, sales, and new products. Just enter your email address below and click Go. Champion Trailers values your privacy and will not supply or sell list information to any individual or company.